Benjamin Wittes (born November 5, 1969) is an American journalist who focuses on issues of national security and law. He is a Senior Fellow in Governance Studies at the Brookings Institution, where he is the Research Director in Public Law, and Co-Director of the Harvard Law School – Brookings Project on Law and Security. He works principally on issues related to American law and national security. Along with Robert M. Chesney and Jack Goldsmith, Wittes cofounded the Lawfare Blog, which is devoted to the discussion of U.S. national security choices. Wittes is also a member of the Hoover Institution's Task Force on National Security and Law. Wittes is a frequent speaker on topics of detention, interrogation, and national security, before academic, government, policy, and military audiences. He is also a co-host of the Rational Security podcast. Wittes was born in 1969 in Boston, Massachusetts. He attended a Jewish day school in New York City, and graduated from Oberlin College in 1990. Wittes brings a non-lawyer's perspective to legal journalism, which has been his primary pursuit. After a stint covering the U.S. Justice Department and federal regulatory agencies for Legal Times, he was an editorial writer (1997–2006) for The Washington Post, concentrating on legal affairs. Publications Wittes has written for include The Atlantic and The New Republic for which he wrote regular columns, and Slate, Wilson Quarterly, The Weekly Standard, Policy Review, and First Things. In a post on Lawfare on January 28, 2017, reacting to Executive Order 13769, Wittes characterized the Trump administration as "malevolence tempered by incompetence." This description received widespread attention and re-use, including its being featured in a New York Times op-ed by Paul Krugman. He is married to Tamara Cofman Wittes. The Future of Violence: Robots and Germs, Hackers and Drones—Confronting A New Age of Threat (2015), written with Gabriella Blum. Introduces a new world of "emerging threats" — from students printing guns with 3-D printers to scientists' manipulations of viruses that can be recreated and unleashed by ordinary people — and attempts an authoritative blueprint for how the U.S. government must adapt in order to prevail and protect its citizens. Detention and Denial: The Case for Candor after Guantánamo (2010), details how U.S. detention policy is a tangle of obfuscation, rather than a conscious serious set of moral, legal, and policy choices. He says there is a need for greater coherence, clarity, and public candor from the American government regarding its detention policy and practices, and greater citizen awareness of the same. Law and the Long War: The Future of Justice in the Age of Terror (2008) is Wittes's analysis of how America came to an impasse in the debate over liberty, human rights, and counterterrorism and draws a road map for how the country and the next president might move forward. Confirmation Wars: Preserving Independent Courts in Angry Times (Rowman & Littlefield, 2006) addresses the transformations the judicial confirmation process has undergone in recent times. Wittes argues that these changes should not be understood principally in partisan terms, but as an institutional response on the part of the legislative branch to the growth of judicial power over the previous five decades. Starr: A Reassessment, Yale University Press (2002). Through ten hours of interviews with the controversial former independent counsel, Wittes examines the role that Ken Starr played in implementing the independent counsel statute and investigating the Clinton scandals. Wittes argues that Starr should be best understood as a decent man who fundamentally misconstrued his function under the independent counsel law. Campaign 2012: Twelve Independent Ideas for Improving American Foreign Policy (2012) provides short analysis of twelve policy issues facing America. Wittes edited Campaign 2012, and also contributed a chapter with Daniel L. Byman on how the next U.S. president should continue fighting al Qaeda while improving relations with Congress over terrorism policy. Constitution 3.0, Freedom and Technical Change, edited with Jeffrey Rosen (2011), details how technological changes that were unimaginable at the time of the Founding Fathers are challenging our notions of things like personal vs. private space, freedom of speech, and our own individual autonomy. Wittes also contributed a chapter on biosecurity, technologies of mass empowerment, and the U.S. Constitution. Legislating the War on Terror: An Agenda for Reform (2009) presents an agenda for reforming the statutory law governing counterterrorism and U.S. national security, balancing the need for security, the rule of law, and the constitutional rights that protect American freedom. Wittes both edited the book and contributed to a chapter with Stuart Taylor Jr., on refining interrogation law. "Against a Crude Balance: Platform Security and the Hostile Symbiosis Between Liberty and Security" (September 21, 2011). Wittes argues that we should think of liberty and security as existing in a kind of a "hostile symbiosis" with one another—that is, mutually dependent and yet also, under certain circumstances, mutually threatening. "The Emerging Law of Detention 2.0: The Guantánamo Habeas Cases as Lawmaking" with Robert Chesney, Larkin Reynolds, and the Harvard law School National Security Research Committee (May 12, 2011). Describes and analyzes the district and appellate courts' work on defining the rules of military detention, to date—and thus maps the contours of the nascent law of non-criminal counterterrorism detention that are emerging from the Guantanamo habeas cases. "Databuse: Digital Privacy and the Mosaic" (April 1, 2011): Wittes explores the possibility that technology's advance and the proliferation of personal data in the hands of third parties has left us with a conceptually outmoded debate over the protection of personal information, one whose reliance on the concept of privacy does not usefully guide the public policy questions we face. "Rationalizing Government Collection Authorities: A Proposal for Radical Simplification" with Wells Bennett and Rabea Benhalim (January 7, 2011). Wittes looks at part of the problem of regulating privacy—the problem of access by government investigators to individuals' personal data stored in the hands of third parties and the inconsistent patchwork of laws that currently governs this sort of collection. "The Emerging Law of Detention: The Guantánamo Habeas Cases as Lawmaking" with Robert Chesney (January 22, 2010). Describes the diversity of opinion among the lower court judges to whom the inactivity of the Supreme Court, Congress, and the Executive Branch had effectively delegated the task of writing the law of detention. "The Current Detainee Population of Guantánamo: An Empirical Study" with Zaathira Wyne (December 16, 2008). Documents and describes, within the extant limits of the then-public record, the detainee population in American military custody at GTMO. ^ a b [ "Benjamin Wittes". Brookings Institution. Retrieved April 18, 2018. ^ "About Lawfare: A Brief History of the Term and the Site"
^ Benjamin Wittes - Penguin Group (USA) Authors - Penguin Group (USA). ^ Benjamin Wittes. Hoover Institution. 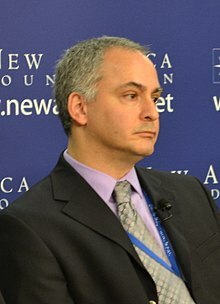 ^ Benjamin Wittes (November 22, 2010). "Thoughts on Being Groped by TSA". Lawfare Blog. ^ Wittes, Benjamin (January 28, 2017). "Malevolence Tempered by Incompetence: Trump's Horrifying Executive Order on Refugees and Visas". Lawfare. Retrieved July 24, 2017. ^ Post, David (May 2, 2017). "The 'sanctuary cities' executive order: Putting the bully back into 'bully pulpit'". Washington Post. Retrieved July 24, 2017. ^ Schlesinger, Robert (February 3, 2017). "The Trump Train Is a Roller Coaster". U.S. News and World Report. Retrieved April 18, 2018. ^ Roberts, Jeff John (February 6, 2017). "Trump's Travel Ban: The Supreme Court and What Happens Next". Fortune. Retrieved July 24, 2017. ^ Homans, Charles (January 30, 2017). "The Chaos at Kennedy Airport, and the Chaos to Come". The New York Times. ISSN 0362-4331. Retrieved July 24, 2017. ^ Toles, Tom (April 5, 2017). "A fish rots from the head, and that leaves the rest of us 'fin'-ished". Washington Post. Retrieved July 24, 2017. ^ Kurtz-Phelan, Daniel (April 5, 2017). "How China's Leader Is Playing Donald Trump". New York Magazine. Retrieved July 24, 2017. ^ Carter, Graydon (March 2017). "Trump's White House: The Gang That Couldn't Shoot Straight". Vanity Fair. Retrieved July 24, 2017. ^ Krugman, Paul (February 13, 2017). "Ignorance Is Strength". The New York Times. ISSN 0362-4331. Retrieved July 24, 2017. ^ "Law and the Long War: The Future of Justice in the Age of Terror". Brookings Institution, June 23, 2008. ^ Confirmation Wars, Hoover Press. ^ "Starr: A Reassessment", The Washington Post. ^ Campaign 2012. Brookings Institution. ^ Constitution 3.0. Brookings Institution. ^ "Legislating the War on Terror: An Agenda for Reform". Brookings Institution, November 3, 2009. ^ "Against a Crude Balance: Platform Security and the Hostile Symbiosis Between Liberty and Security". Brookings Institution, September 21, 2011. ^ "The Emerging Law of Detention 2.0: The Guantánamo Habeas Cases as Lawmaking". Brookings Institution, May 12, 2011. ^ "Databuse: Digital Privacy and the Mosaic". Brookings Institution, April 1, 2011. ^ "Rationalizing Government Collection Authorities: A Proposal for Radical Simplification". Brookings Institution, January 7, 2011. ^ "The Emerging Law of Detention: The Guantánamo Habeas Cases as Lawmaking". Brookings Institution, January 22, 2010. ^ "The Current Detainee Population of Guantánamo: An Empirical Study". Brookings Institution, December 16, 2008. This page was last edited on 22 February 2019, at 03:29 (UTC).